In October 2009, we begin a new tour and seminar series: Fine Art and Photographic Reproduction, sponsored and organized by Digital2You (Digital2You.cc) This series provides an in-depth review of the subject from several viewpoints: first, for photographers who want to make their own fine art prints. Second, curators, galleries, and other organizations in working with artists and their work in the context of creating open- and limited reproduction editions of their artwork. Third, for artists who wish to expand their marketing efforts and created editions of their work for exhibition and sale. Beginning October 2, 2009, and continuing through October 20th, the Tour covers seven cities in three states (Arizona, Colorado, and New Mexico). A full-day workshop which covers the complete scope of work involved in producing fine art prints, and also reproduction of fine-art watercolor, oils, and acrylic artwork. We begin with art selection, proceed to planning workflow, image capture, processing, color management, output devices media selection, printing, edition management, certificates of authenticity, print finishing, and more. 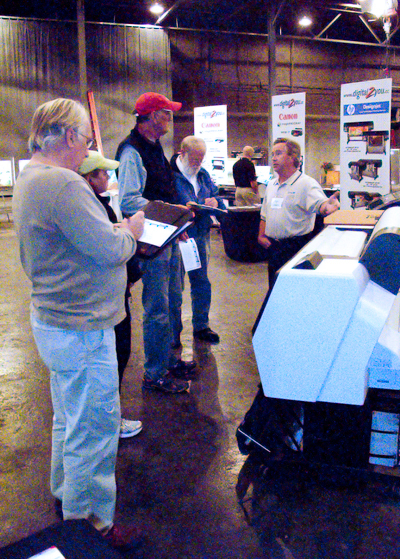 A Tech Expo which provides an opportunity for hands-on experience with a number of printer manufacturers’ equipment, color management, displays, and more. This schedule may be subject to change. PLEASE BOOKMARK or subscribe to this page to keep up to date. For registration links, go to the Digital2You.cc hereor CALL FOR DETAILS 303-934-2777.